Disco isn’t dead. At least not at the Broward Stage Door Theater in Margate, where increasing numbers of disco divas and down-to-earth denizens are flocking to experience Saturday Night Fever, the musical that turned normal 1970s evenings into disco nights and sent millions to apparel stores to buy satin shirts and boogie shoes. The musical adaptation based on Nik Cohn’s 1975 New York magazine article called “Tribal Rites of the New Saturday Night” and the 1977 film utilizing Norman Wexler’s screenplay and starring John Travolta put discotheques on the pop dance map and sent groups like the Bee Gees soaring into the disco-sphere. Saturday Night Fever is drawing near sellout crowds to the Sample Road venue, despite a one-weekend interruption by Hurricane Irma. Kevin Black is back to direct this show that’s just hit the road to honor the 40th anniversary of the movie. 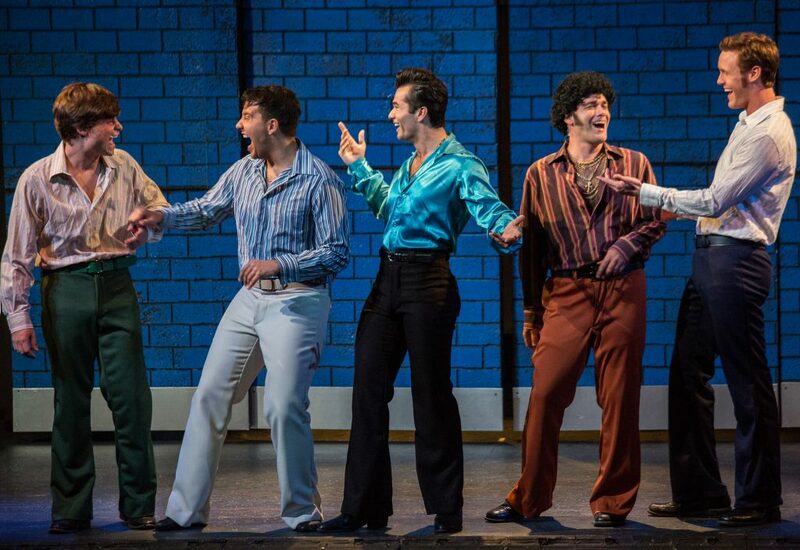 The musical focuses on Tony Manero, a 19-year-old Italian hot shot from Bay Ridge, Brooklyn, whose weekends are spent dancing at a local discotheque. There, he can luxuriate in the admiration of an “aw-Tony” crowd and a growing relationship with wannabe sophisticate Stephanie Mangano (Alexandra Milbrath) and temporarily forget his depressing home life, dead-end job in a paint store and his gang of deadbeat friends. Black has located the quintessential Tony – a Californian named Daniel Velasquez who lives, breathes and exudes Tony Manero every nanosecond he’s on stage. Forget Travolta, this guy is the real deal – and he works his prowess live in front of your eyes. He seamlessly manifests the Brooklyn dialect, the swagger, the strut and even the disco line dance. Velasquez is part of a big cast whose singing and dancing talents are unsurpassed in the regional theater realm. All seem to have the ability to hit high notes and execute high kicks with precision. Choreographer Danny Durr – who has roles as Chester and Pete – is clearly a dance master – and others follow his lead. Saturday Night Fever also plays well because it’s neither a disco tribute nor documentary. If anything, it’s an examination of 1970s social mores – the sexual freedom of the pre-AIDS period, teenage pregnancy, gang rivalry, accidental death, obsession and love triangles. An emphasis on dance and music intersperses the action and prevents any subplot from growing too large. The Bee Gees provided a good deal of the music for Saturday Night Fever with songs like “Stayin’ Alive,” “Night Fever,” “You Should Be Dancing” and “Jive Talkin.’” Performers at the Broward Stage eschew the group’s squeaky falsetto in favor of normal singing voices. Tony frequently sings with his “guys”: Bobby C. (Bruno Faria), Double J. (Sean Dorazio), Gus (Steddy Amory) and Joey (Sean Davis). They combine with ensemble members for “Stayin’ Alive” and really work the K.C. and the Sunshine Band tune, “Boogie Shoes,” with lyrics and dance. Saturday Night Fever is buoyed by a spirit that everyone from the neighborhood knows everyone else – and they all want to help, if they can. Tony’s love interest, Milbrath, allows him to let his guard down and realize that he wants more out of life than just to dance. Faria, who plays Bobby C., seems the most thoughtful and stable of Tony’s friends, though he admits to being a screw-up. He is the only character who doesn’t survive. Kelly Ziegler, who plays Bobby C.’s girlfriend, Pauline, is a great singer and dancer, but is saddled with perhaps the toughest acting role – portraying a jilted young woman unable to reach Bobby C’s heart despite valiant efforts. Actually, he does fall in love with her, but she doesn’t find out until it’s too late. Sandi Stock plays Annette, the woman who loves Tony dearly, but he treats her with disdain and heaves her aside for Stephanie. Christopher Rodriguez portrays Tony’s brother, Frank Jr., in a small, but pivotal part. Tony has always lived in the shadow brother, a priest, who has come home to tell the family he’s leaving the order. The family is crushed. Tony is shocked, but relieved of a heavy burden. In addition to the on-stage action, the stage setting has a very downtown Brooklyn feel, and the transitions between scenes are practically flawless – a credit to the backstage team. 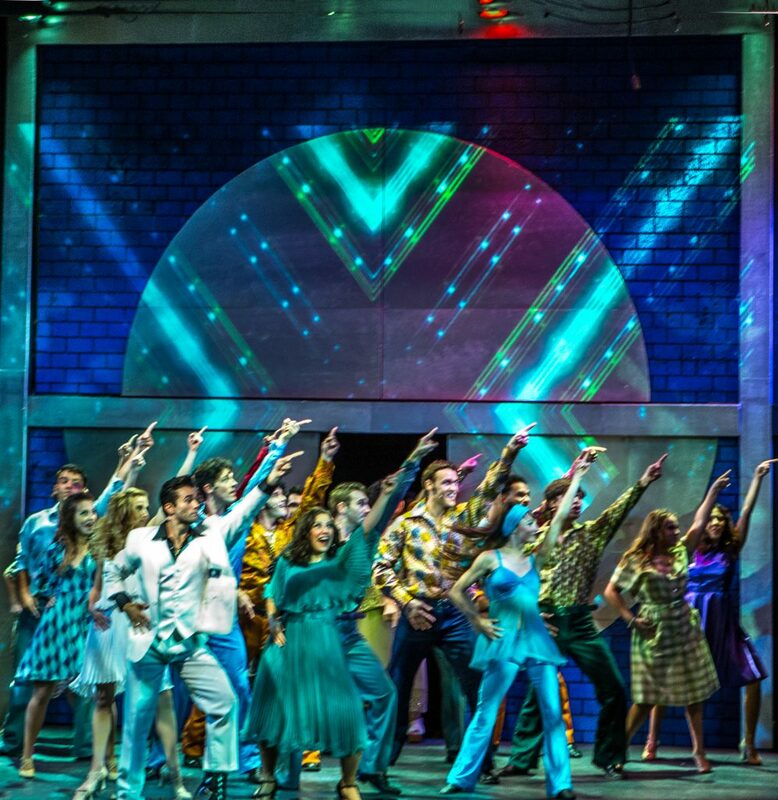 Saturday Night Fever plays through Oct. 15 at the Broward Stage Door Theatre, 8036 Sample Road, Margate. Tickets are $48. (Student prices are also available with valid ID). Tickets may be purchased by calling 954-344-7765 or going online at www.stagedoorfl.org.